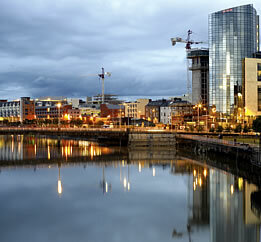 Limerick is a great city that is filled with history and Irish pride and is the host to the 2008 SPLC Conference. I came here once before (to present a paper on product lines) for the ICSE 2000 conference at Limerick University and remember the place fondly. From Wikipedia: The city itself dates from at least the Viking settlement in 812. The Normans redesigned the city in the 12th century and added much of the most notable architecture, such as King John’s Castle and St Mary’s Cathedral. During the civil wars of the 17th century, the city played a pivotal role, besieged by Oliver Cromwell in 1651 and twice by the Williamites in the 1690s. Limerick grew rich through trade in the late 18th century, but the Act of Union in 1800, and the famine caused a crippling economic decline broken only by the so-called Celtic Tiger in the 1990s. 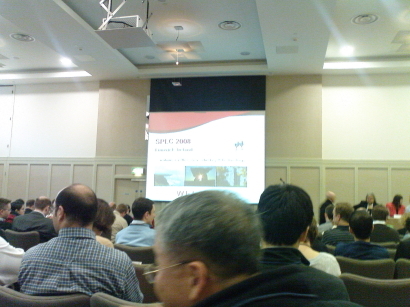 The SPLC 2008 (SystemicLogic is a Gold Sponsor!) had brought together 233 people from some 15 counties. I’m the only one from Africa and there are a few people from Australia. The content is great as usual and the focus is still primarily on electronics, automotive, military and complex manufacturing related activity. 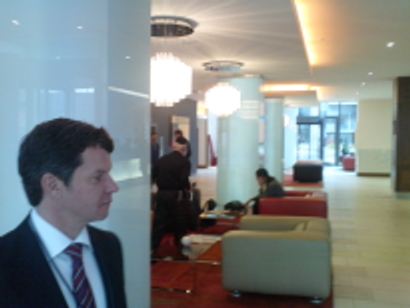 We (Martin and I) were the only people with a focus on financial services. Our presentation and paper attracted a lot of attention as the move towards Service Line Practice is not being considered by this community. The abstract of our paper is (Martin Krsek, Dr. Jay van Zyl, Robert Redpath, Ben Clohesy): Product Line concepts are widely used and adopted across a number of industries. Whilst the software product line concepts are readily accessible to commercial software product companies, the application within corporate environments whose core business is not software has been less evident. What are the types of challenges that large corporate organisations need to overcome? This paper presents a number of hurdles which have been observed during the adoption of the concepts at two large financial services organisations. One particular hurdle relates to the difficulty that business divisions within those organisations have in perceiving a return on investment when a product line is established that crosses business unit boundaries. Furthermore a number of enabling mechanisms, related to funding, IT project and general management aspects are proposed which are showing positive results in facilitating the adoption of Product Line Practices in corporate financial service organisations. Some of the conclusions from the paper are: From our observations it is a key issue that the Software Product Line approach is demonstrated to align with the organisation’s strategic business objectives, and is shown to provide business benefits with acceptable risk. Modeling techniques and tools are available for product line modeling and they should be used to aid this strategic alignment. The business silo project driven organisation design must be amended and complemented specifically with the creation of a product management function and governance mechanisms to ensure that products scoped into a product line are not withdrawn without due consideration of the implications, and specifically the implications for the product line business case. – An economic model comprising the initial investment, charging model and return on investment by the product line over time must be designed and integrated into the internal costing mechanisms of the organisation. Financial service organisations that pursue the adoption of Software Product Lines by addressing these hurdles are positioning themselves to derive similar benefits, albeit on a smaller scale to those obtained by commercial software companies operating in the open market. – Future work will undertake further empirical studies, at large financial institutions, of Software Product Line adoption to more closely identify the hurdles to adoption as well as refining the solutions and enablers to overcome them. Approaches to be employed will focus on identifying and formalising points of commonality and variability during requirements modeling and engineering. – In addition, economic models and methods to motivate a view of software as an asset based on traditional valuation models, as used for physical assets that exhibit features of an upfront investment, compulsory charges for those making use of the asset, ongoing maintenance costs and depreciation over the life of the asset will be investigated. The presence of service oriented architectures must also be factored into approaches and a conception of Service Line Practices introduced with their attendant implications and shift in thinking.